Ed. note: All numbers in this post are according to NBAwowy.com. I have been strident that Andre Drummond and Greg Monroe can't play together. The Pistons do not necessarily play worse when the pairing shares the court. Piston Powered's Dan Feldman and I discussed this on Twitter yesterday: the Pistons have actually outscored opponents this season with Drummond and Monroe on the floor together without Josh Smith, albeit by a slim margin (prior to last night's game, the duo outscored opponents 118 to 101 through 109 possessions when on the floor together this season). The problem stands as a structural one, borne of the players' respective inability to step away from the basket on the offensive end of the floor. Monroe makes this shot, the kind of circus layup that has sent his field goal percentage at the rim careening to the 48.9% that it stands at today. Monroe has never been an efficient finisher at the rim, but the level he's performing at currently is untenable and a function of Drummond's inability to step away from the rim. When Monroe is on the court without Drummond, his effective field goal percentage is at 52.6%. When the two are on the court together, Monroe's effective field goal percentage plummets to 42%. The issue extends further than contested shots at the rim. Not only is Monroe taking worse shots when Drummond is on the court, he's taking different shots. Without Drummond on the court, Monroe takes 64% of his shots between 0-3 feet from the basket, and only 32.5% of his shots from 4-9 feet from the basket. With Drummond on the floor, Monroe's shot distribution becomes less effective: only 47.7% of Monroe's shots come from 0-3 feet, while 44.3% of his shots are taken from 4-9 feet. The screenshots above illustrate why. Monroe understands that help defense will come from the opposing frontcourt players when Drummond is on the floor. The layup that he makes above is not a high-percentage attempt, but is the kind of shot that Monroe can generate when the two play together. Perhaps more telling is Drummond's effective field goal percentage when the two play together. Without Monroe on the floor, Drummond posts a 43.4% eFG% this season. However, when they're in the frontcourt together, Drummond's effective field goal percentage rises to 50%. These shooting percentages are low for any big man in the league, but that's the status of the Pistons in 2014. What the numbers do show is a distinct picture of how these two play together. Drummond has always feasted off of missed shots and putbacks. 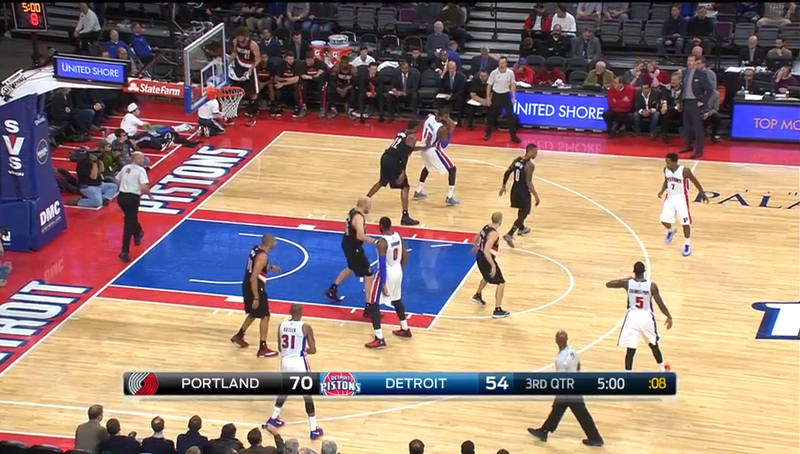 With Monroe on the floor, Drummond has ample opportunity for these easy baskets. Since Monroe's shot selection rarely extends beyond 10 feet, rebounds likely won't bounce further than Drummond can reach and return to the rim quickly. 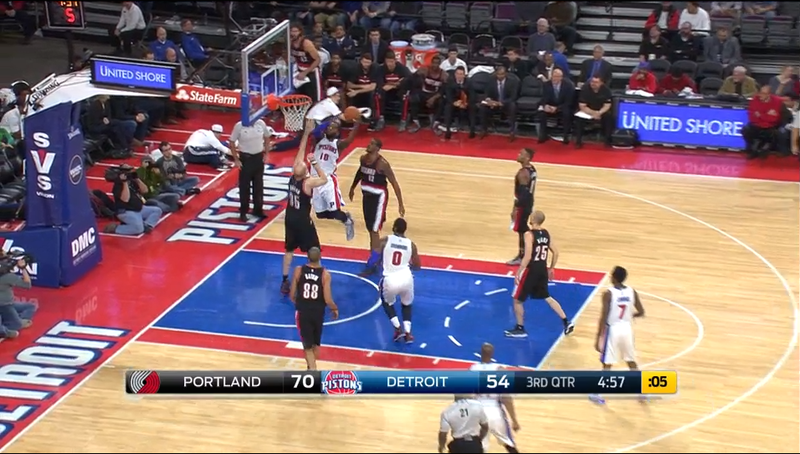 Meanwhile, Drummond's mere presence forces Monroe into worse shots. They're magnets being pressed together, like poles repelling one other. Though problems with his game abound, Josh Smith stands as an integral part of Stan Van Gundy's schemes. Smith's dreaded mid-range shots are a necessary evil of the Pistons' post-up offense. The issue is not the shot, it's that Smith isn't Kevin Garnett. SVG's schemes require a stretch power forward for the reasons outlined above. Without the ability to extend the defense between them, Monroe and Drummond will occupy the same court space and find success from the failures that they're causing in one another. I am not advocating that Smith takes more midrange shots--I'm excited by the shift to a high pick-and-roll offense SVG uses with Smith as the roll man--and get just as frustrated when Smith heaves ill-fated long jumpers. But Monroe and Drummond together detract from one another, causing the Pistons to run in place rather than develop as a young, talented group should. SVG seems to have noticed the same phenomenon. This is the reason Monroe comes off the bench to start games and why Monroe replaces Drummond rather than Smith at the first substitution. In recent weeks, SVG has worked to keep Monroe and Drummond separated, only playing the two together when the team's regular rotation struggles to generate any offense. This Pistons roster is broken, but Stan Van Gundy capitol-G, capitol-I Gets It.